If you hate mushrooms, look away now! Carluccio’s are celebrating a festival of funghi with an Autumnal focus on mushrooms. There’s lots of products in store that can help enjoy this aromatic and versatile ingredient. 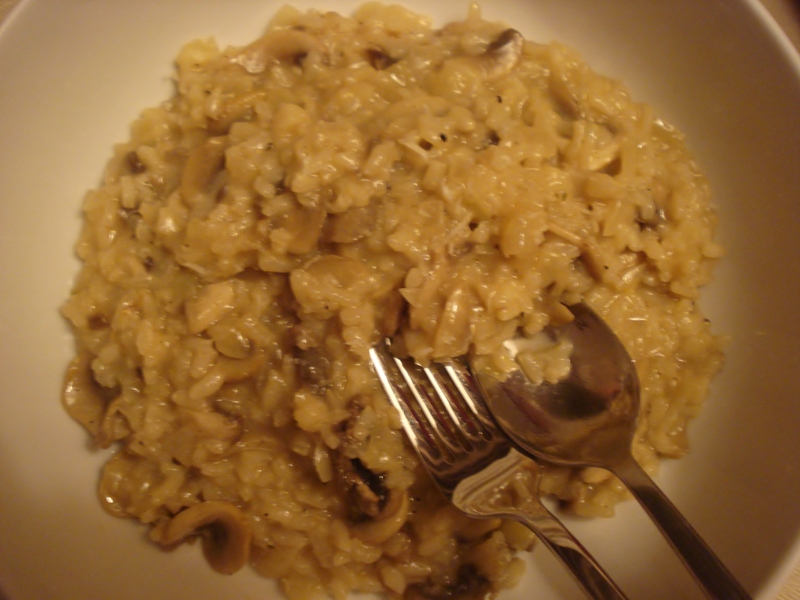 This is a celebration of the mushroom in probably my favourite form: a risotto. The layering of flavours here results in an earthy, savoury dish of rice that enriches the heart and tastes of pure luxury. The key to a creamy, tasty risotto is to give that rice a good bashing. Stir aggressively, so that the starch comes away from the surface. This forms the creamy consistency of a perfect risotto. That, and the beating in of butter at the final stage, before letting it rest a moment. There are also three magic Carluccio’s ingredients in this recipe that make it special: carnaroli rice which is plump yet creamy, porcini oil that provides fragrance and porcini stock. The porcini stock comes highly recommended – it is full of mushroom flavour and has the smack of umami that satisfies. Visit Carluccio’s for more info. Thanks to Carluccio’s for the ingredients to try. Get the stock on to simmer. Add the rosemary and mushroom stalks. Gently fry the onions and garlic in a little oil until translucent. Add the mushrooms and cook for another couple of minutes to soften. Turn the heat up and add the rice, stirring the whole time to toast the outer surface of the rice without burning. After a minute add the wine and deglaze the pan with it. Add the stock a ladleful at a time, taking care not to add the stalks. Each time stir the rice well and don't add any more liquid until the previous ladleful has been absorbed. After about 15 minutes of adding stock taste the rice for doneness. You want something squishy but not complete mush. At that point turn the heat off and beat the parmesan and butter into the rice vigorously. Taste, adjust the seasoning, pop a lid on top and let stand for a minute or two. Serve by adding a couple of drops of truffle oil. I’ve been looking for a great mushroom risotto recipe, and I think I just found it. Looks awesome! Will definitely be giving this one a go. You’re welcome! If you like mushrooms, this is the one for you. Let me know how you get on.